Product #20639 | SKU 4017B-R | 0.0 (no ratings yet) Thanks for your rating! Designed for demanding sound capturing in film, video, and more. 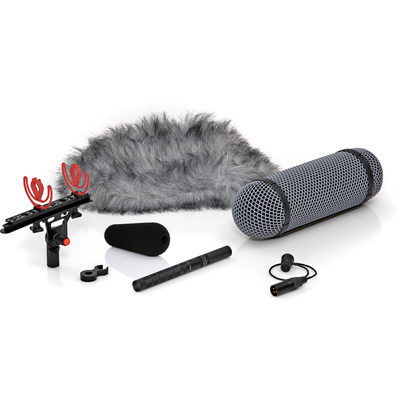 The DPA 4017B-R Shotgun Microphone includes the Rycote windjammer, windshield, suspension mount, XLR holder and brush for complete protection against wind noise during field recording. The professional and versatile 4017B microphone is designed for demanding sound capturing in film, video, sound reinforcement and even music recording. The supercardioid, lobe-shaped polar pattern is coupled with excellent off-axis signal rejection for a focused pickup, enhanced range and minimal noise. The condenser capsule uses a high voltage pre-polarized back plate, endowing the shotgun with high output as well as wide dynamics, extremely low noise and distortion specifications.